Company upgrades from .net to .com after The Profit host Marcus Lemonis invests in business. This toy store upgraded its domain to SantasToys.com. 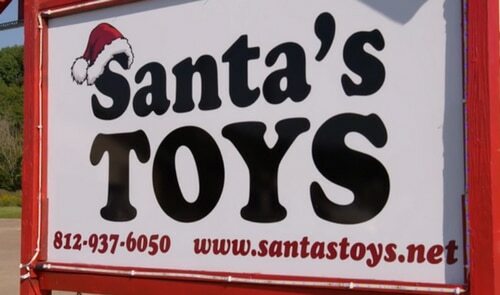 Over the holidays, CNBC’s The Profit featured a store in Santa Claus, Indiana called Santa’s Toys. On The Profit, host Marcus Lemonis invests in a business and works one-on-one with its owners to help it improve. In this episode, Lemonis invests $75,000 in the business but lets the owner keep 100% of the store. He’s more interested in the nascent e-commerce business, of which he negotiates for 50%. There’s a big problem with Santa’s Toys web presence, though. It’s on SantasToys.net instead of .com. Around the 5 minute mark of the episode, Lemonis asks the owners why they went with .net instead of .com. They said the .com domain was more expensive each year. Actually, the problem was that the .com was registered well before the owners got SantasToys.com. Lemonis doesn’t like .net and blames some of the site’s lackluster success on the choice of domain. “Maybe because nobody knows .net,” he says. He buys SantasToys.com as part of the site relaunch. It’s an interesting episode that you can check out here. I believe this episode confused the annual renewal fees versus the one-time purchase price of the .net and .com versions, and then glossed over the purchase price of SantasToys.com. I don’t believe they even mentioned if someone had already registered SantasToys.com (probably) or what SantasToys.com cost to acquire. It’s also unfortunate that Marcus Lemonis says he was picked on and bullied as a kid for being overweight, yet he investments in businesses that sell fattening and sugary foods (i.e. Standard Burger and Sweet Pete’s). Anything to make a “profit”? Maybe he believes in the free market and free will. OMG, because he was overweight as a youngster he shouldn’t invest in Standard Burger or Sweet Peetes! Marcus Lemonis investing in the sugar businesses are my favorite episodes. I don’t believe he invests in these businesses just to make a “profit”. Used to watch that show. Lemonis is a genius. I don’t know about this show until now… thought will watch the video and yahoo says their video library is limited to United States for now..